This is the place to find out the latest about our sports teams, as well as the PE activities going on in school and our sporty after-school clubs. Well done to our Year 5 and Year 6 teams on reaching the LSSP Football City Finals at LFC Academy. Both teams played really well in their competitions and gave it their best efforts. Our Year 5 team marginally missed out on being City Champions, drawing their last match against a very well organised St Francis De Sales team. Our Year 6 team had mixed results in their competition and every single match was so close. Although not being crowned City Champions, it was a great effort from both teams, well done everyone! Congratulations to our girls on reaching the City Final Swim Gala! The girls swam really well in what was a really tough event and it was clear to see the children really enjoyed it. We were delighted to find out we had finished in 2nd place and earned ourselves a spot in the Merseyside School Games Finals in July! Well done!! It was the last cross country event of the season this week as our Y5 and Y6 boys and girls teams took part in the City Championships at Wavertree. Each race had 14 of the best represented small and large schools, and the best individuals competing against each other. Our boys' and girls' swim teams were at Liverpool Aquatics Centre this week, competing in the South Liverpool Heats. Again, the competition was really tough and both teams gave their best efforts. The boys team finished in 4th place overall and the girls finished in 1st place, qualifying for the City Finals. Good luck girls! 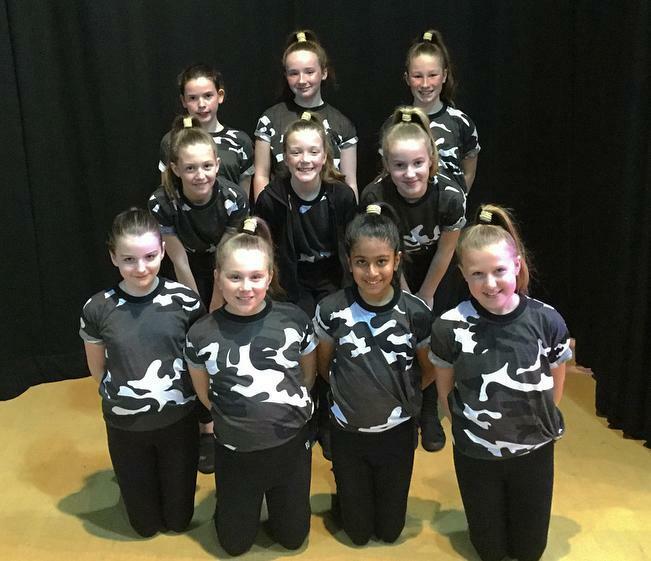 Following weeks of rehearsals, 3 dance troupes from school took part in the LSSP Dance competition at North Liverpool Academy. The standard of competition was fantastic and our troupes performed brilliantly in front of a really big audience! We are delighted with the children's courage, commitment and passion towards their performances and hope this experience will be a memorable one for all of the children. Well done to everyone involved. 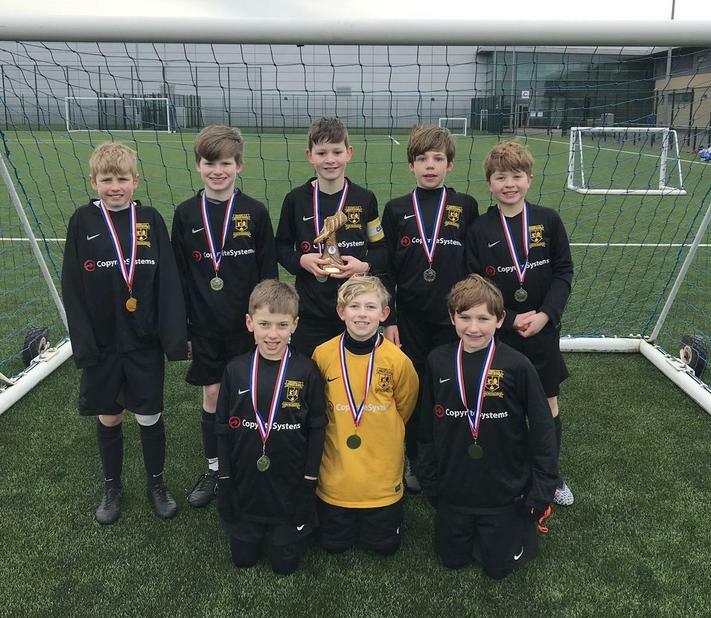 It was the Y6 boys football competition at The LFC Academy this week and the children were hopeful of reaching the City Finals next week as the top 2 teams would qualify through. The boys played brilliantly, going unbeaten all the way through to the final. Following a 0-0 draw in the final, we were beaten on sudden death penalties by Bishop Eton. Nevertheless, the team were really happy to have qualified for the City Finals next week along with our Y5 boys. Good luck everyone! Last Friday, our girls' team played their LSFA fixture away to Christ the King. The girls played great football and battled well throughout the game. The final score was Christ the King 1 - 4 Childwall. Well done, girls! 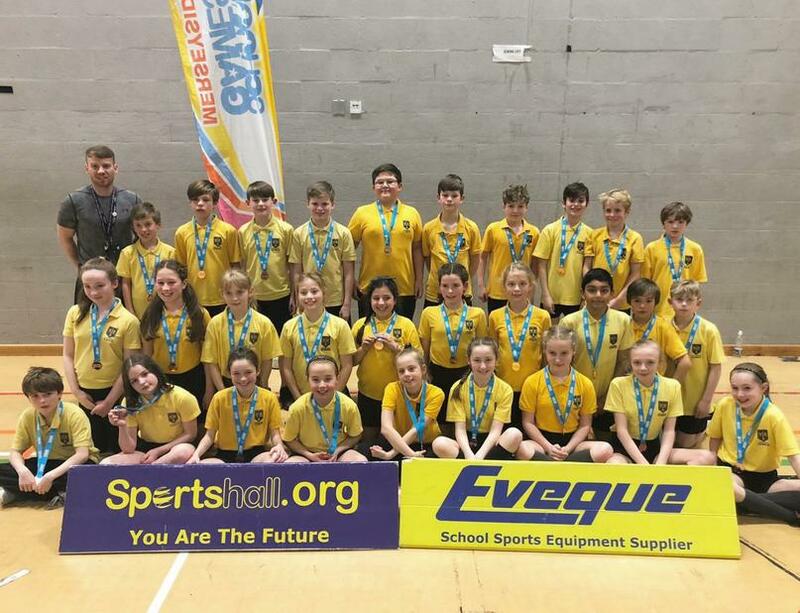 It seemed like a lifetime ago that our Y5&6 Sportshall Athletics team had gained qualification for this year's Merseyside School Games Finals, and it finally took place this week. As always, the school games finals never failed to produce the best athletes throughout the County and it was amazing to see the standard of participation so high! Up against 15 of the best schools from around Merseyside, we were thrilled to find out that we had finished in third place in the County and received bronze medals for our hard work and efforts on the day! A great all round team performance and again, a great achievement from our children. Well done to all the children involved. It was the Cross Country City Championships this week at Wavertree and our 4 teams ran separately in their respective races and produced their best overall performances of the season. Check out our finishing results!! Y5 Large Schools Boys - Champions! Y5 Large Schools Girls - Champions! Y6 Large Schools Boys - Silver Medalists! Y6 Large School Girls - Champions! Congratulations to all of our runners this week, an absolutely fantastic achievement! They will have their final race of the season next week in another Championship event against the best runners from all schools in the City! Good luck, everyone. The girls played this week’s Broadgreen League match against Blessed Sacrament in a game which was fast paced and competitive. A 3-2 defeat wasn’t the result we deserved but the girls were fantastic as always, battling to the end! Great effort from everyone, we look forward to our next match! The boys played two matches in the LFC Foundation 7-aside League this week, marginally losing their first match before comfortably winning their second. Although not the results we were looking for, the boys were happy to get more playing time under their belts. Well played boys. 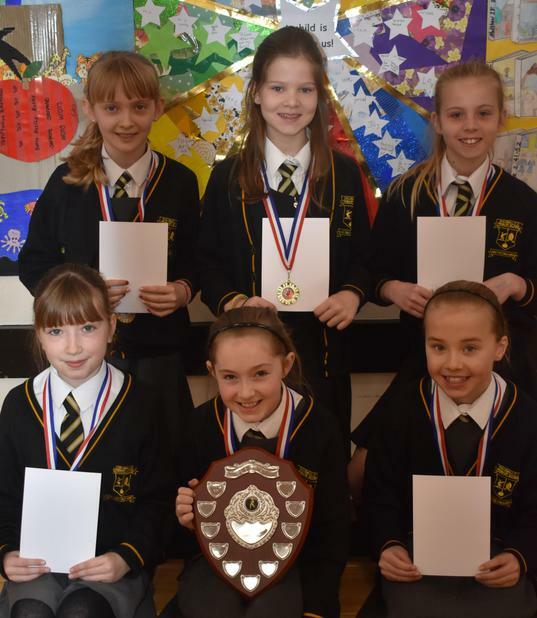 Our Y5&6 Table Tennis team took part in the Merseyside School Games Finals at Halton Table Tennis Club this week. The team played brilliantly throughout the group and knockout stages, progressing all the way to the final. Unfortunately, the team were unable to win their last match against an excellent St Bede's team who had U18 and U16 National standard players. However, our team were delighted to take home the silver medals and recognised their overall achievement. Great job everyone, well done! It was a great opportunity for some of our Y5&6 boys to represent the school for the first time in a football match against St Michael in the Hamlet. The boys really enjoyed their experience and showed how much they have improved since September. Well done everyone! 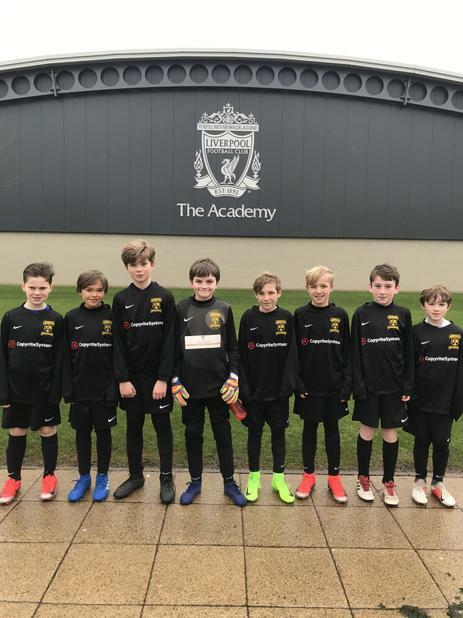 With a chance of representing Liverpool Football Club in the Premier League Primary Stars National Finals in May, our boys and girls team played in the regional finals at the LFC Academy this week. The boys just missed out on progression to the final as they finished in second place in their group, following some really impressive performances. Then, the girls played their best football of the season against some really tough opponents, also just missing out on progression to the final which came down to goal difference. Disappointing for both teams, but nevertheless a fantastic experience which was thoroughly enjoyed by all of the children, great effort everyone! The final Cross Country League race took place at Wavertree this week and it was a big turnout from all schools. Following results from race 5, the children were aware that a win for both teams would secure the League Championship. Two fantastic races from both teams raised excitement going in to the presentation. 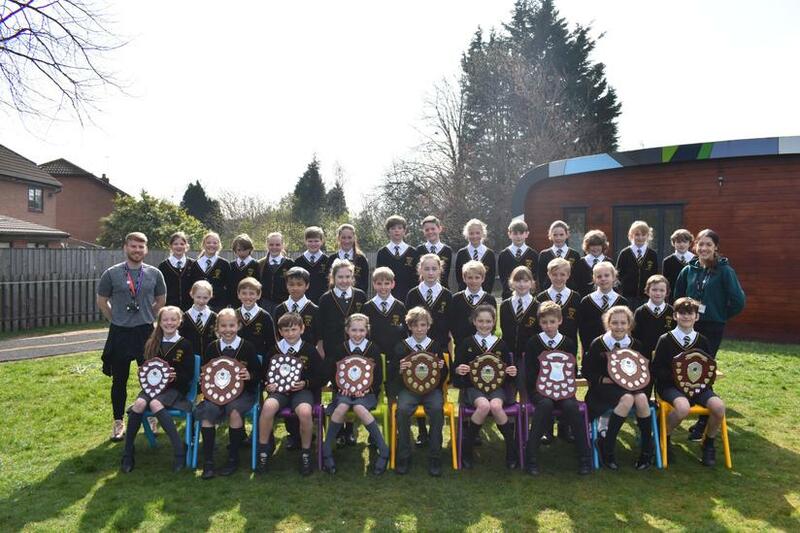 The children were delighted to find out that both our boys' and girls' teams were Cross Country League CHAMPIONS!! A fantastic achievement from all of the children involved, congratulations! Another Broadgreen League match saw a tough game against Blessed Sacrament. The boys battled hard throughout the game and defended really well to keep the opposition at bay. A late goal from Tom secured a 3-1 victory. Well done boys. It was the Y5 boys' turn to take part in the LSSP Football Competition ran at the LFC Academy this week. The boys went unbeaten throughout the entire competition, conceding only two goals in 7 matches. They played fantastic football which caught the eye of all the LFC coaches and referees, as they thoroughly deserved to win the competition and qualify for the City Finals taking place in May. Congratulations boys and good luck! Our boys' and girls' competed in the 5th Cross Country League Race of the season at Sefton Park this week and both teams performed brilliantly. Congratulations to Jack who finished in 1st place, receiving a gold medal for his tremendous race and also to Maisie H for taking the bronze medal in the girls race! We anxiously await the overall team scores for this race as the battle for the League Championship is still ongoing. The final race of the season takes place on Tuesday at Wavertree, good luck everyone! The girls attended the district level tournament of the PLPS, hosted by the LFC Foundation this week in hope of reaching the Regional Finals at The Academy next week. The girls played extremely well going unbeaten throughout the tournament, without conceding a single goal. We are delighted to have qualified for the Regional Finals and are one step closer to reaching the National Finals at Molineux Stadium. Well done, girls! Our Y4 boys' football team took part in the LSSP football competition at the LFC Academy this week. The boys were fantastic in their performances, demonstrating teamwork, passion and determination! They played 6 group matches, going unbeaten throughout before qualifying for the semi final. A tough semi final against a strong Blackmoor team saw the game go to penalties after a 0-0 draw. Unfortunately, we were beaten on penalties 2-1! A fantastic effort from the boys, well done everyone! The girls played their cup match against a tough Gilmour team and it was a really fast and exciting game. Although we seemed to have created more goal scoring chances, we found ourselves 2-0 down at half time. The girls battled well in the second half but couldn't turn the game around to get the result. Good effort girls, well played. Following their qualification last week, our Y2 Matball team took part in the City Final event at Toxteth Firefit Hub. The standard of play was really high and the children thoroughly enjoyed their experience. They just missed out on progressing to the semi finals on goal difference but were still really pleased with their efforts! Well done everyone. A goal from Tom secured another Broadgreen League win against St Oswald's this week. The boys are still unbeaten in the league and looking stronger each week. Keep it up boys! A group of Year 2 children took part in the KS1 LSSP Matball Competition this week at King's Leadership Academy. The team played 4 group matches, winning all of them before progressing to the semi finals. The team then won their semi final match to secure a place in the City Finals which will take place next week. Excellent performance everyone, good luck in the City Finals! Both our boys and girls football teams had a brilliant morning at Finch Farm in the Regional finals hosted by Everton FC this week. 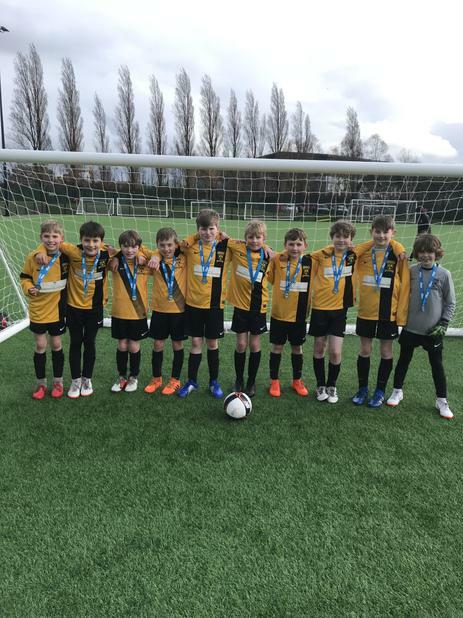 Following their qualification through the district competition in October, both teams were hopeful of reaching the National Finals at Molineux Stadium, home to Wolverhampton Wanderers FC. The girls team came really close following their good run in the competition, which unfortunately came to an end in a semi final penalty shootout. An absolutely great effort girls! Our boys team didn't start the competition well, losing and drawing their first two games. Impressively, they turned the tournament around by producing 4 consecutive outstanding performances, securing a penalty shootout win to go through to the final. We are thrilled to announce that we won the final 2-0 and will go on the represent Everton FC in the Premier League Primary Stars National Finals in May. What a fantastic achievement boys, well done. The girls played at Heron Eccles this week in a Broadgreen Group Cup match against Normal Pannell Primary School. The girls demonstrated their much improved all round game, winning comfortably in the end. Great game, girls! The boys played their Broadgreen League match at Cardinal Heenan Catholic High School this week against Gwladys Street Primary School. The boys played brilliantly and secured all three points to continue their unbeaten run in the league. Well done boys! Our trained Y5 Activity Leaders started their lunch time rota this week. 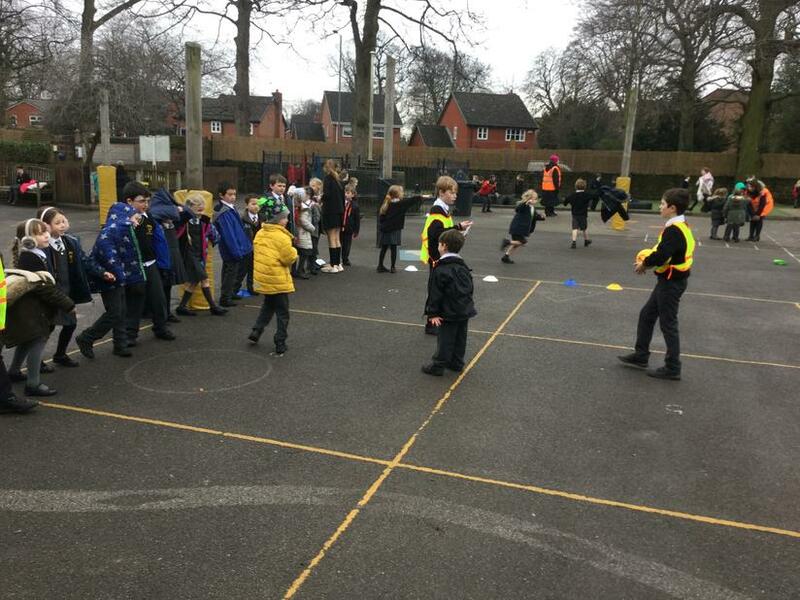 The KS1 children have enjoyed joining in with their games and keeping active at lunch times. It's been a great start for the leaders who have done a fantastic job of organising, demonstrating and delivering these activities. Well done all and keep it up. Following a nightmare journey through the snow, our team finally reached Toxteth Firefit Hub for the Y3&4 Sportshall Athletics City Finals! The boys and girls took part in all of their events, with all of their scores combined to give an overall team score. The races in particular were phenomenal with all athletes showing great speed and determination. We were told before the last event of the morning that all of the scores were really close and the Javelin event would have a significant impact on the overall winners. The children waited anxiously for the results and were thrilled to hear that they had been crown CITY CHAMPIONS! A fantastic all round team performance, well done everyone. It was the Y5&6 Basketball City Finals at Archbishop Beck this week and the standard of play was really high! Our team didn't get off to the best start, losing and drawing their first two group matches. The boys responded brilliantly by going on to win all three of their remaining group matches to qualify for the semi finals. We met Bishop Eton next in what was a really tight game, however, we held our nerve in the shootout to secure a place in the final. It was a really strong St Anne Stanley team in the final and it was a thrilling final match to watch. With 1 second remaining, a stunning shot from Josh sent the game in to over time, before yet another shootout! Again, our boys held their nerve to win the shootout to be crowned Y5&6 Basketball CITY CHAMPIONS! Congratulations to the team, great achievement. They have now qualified for the Merseyside Finals, good luck. 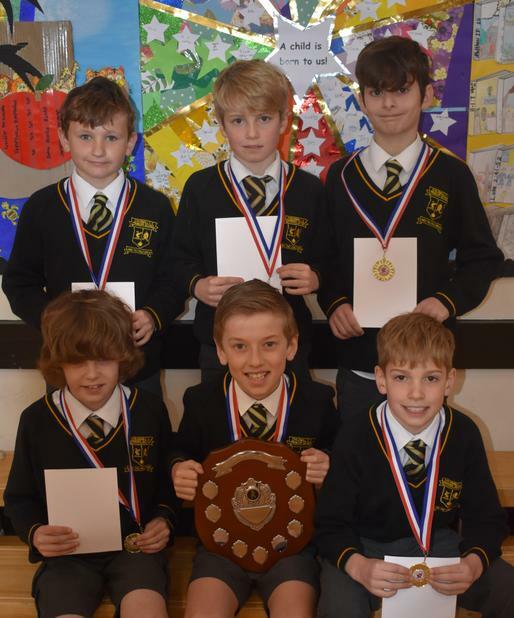 5 boys and 5 girls from Year 2 took part in the LSSP Gymnastics Competition. The competition was made up of 5 categories including balances, jumping and sequences. All the children performed their routines to the judges and were scored accordingly. Although not winning the competition, the children were really happy finishing in 3rd place overall! Great result, well done. The boys had two games in the LFC Foundation League this week and it was a great opportunity to include more members of the A squad into the team. The boys were really unlucky not to win both of their matches. A 3-2 defeat against St Paschal Baylon and a 2-1 win over St Anne Stanley were the final results. The girls played their Broadgreen League fixture against an unbeaten Bishop Eton team and knew they were going into a tough game. The girls showed lots of energy and passion but despite our two goals, couldn't get a winning result. Well done girls, great effort. The boys played a really strong St Paul's team in the opening group cup match down at Heron Eccles. The scores were level at half time following two good goals from Tom and Jack. The second half saw two late goals from St Paul's which resulted in our boys' first 9 a-side defeat of the season. Great effort boys, we look forward to the next game. Our Y5&6 Basketball team took part in the LSSP Basketball Heat at SFX College this week. Following an unbeaten run in the group stages, the team progressed through to the semi finals and secured themselves a spot in the City Finals taking place next week. Well done everyone, good luck in the Finals! Our Year 5 Activity Leaders really enjoyed training alongside our lunch time staff to develop their all round sports leadership and confidence this week. With the guidance and support from our staff, the children will soon begin to deliver organised and structured games on the yard for their peers. This will help to encourage all children to keep active during lunch and break times. We look forward to starting this program! The girls were due to meet Blessed Sacrament Catholic Primary School in a Broadgreen Cup clash this evening. However, the game was postponed due to the bad weather and will be rescheduled soon. It was the Y3&4 Sportshall Athletics Heat at Broughton Hall High School, with a City Final spot up for grabs for the winning team. There were 5 schools taking part in the heat, competing in a total of 11 boys’ and girls’ events, including a variety of relay races, jumping events and throwing events. 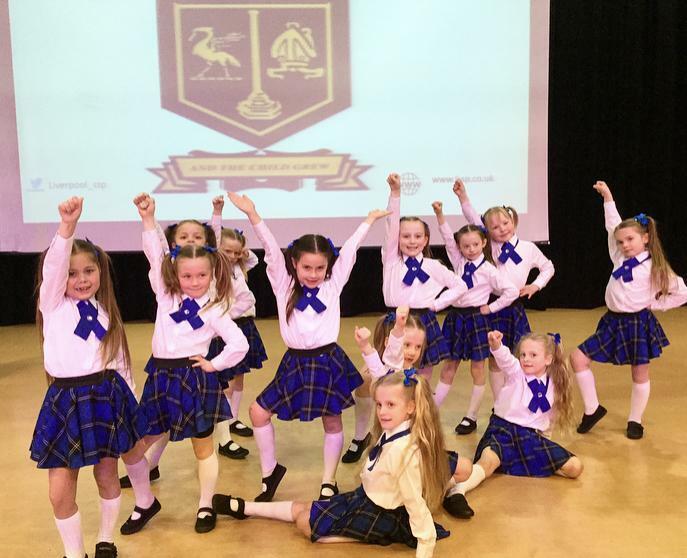 The children performed really well in all of their events and every single point accumulated was vital to the overall score. We were overjoyed to find out that we had won the competition and had qualified for the City Finals! Congratulations all and good luck in the Finals. 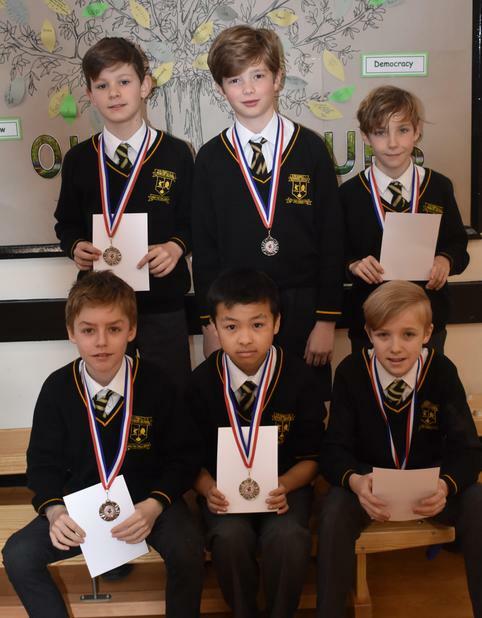 Our two Table Tennis teams competed in the City Finals following their qualification before the Christmas break. The teams played brilliantly, with Childwall A winning all of their group matches to progress to the semi-finals and Childwall B finishing in joint second place. Unfortunately, Childwall B didn't quite make it to the semi-finals due to the 'sets won' rule. Childwall A went on to win both their semi-final and final match and were crowned CITY CHAMPIONS! A great result for the team who have brought back our first trophy of 2019; well done to all of you. 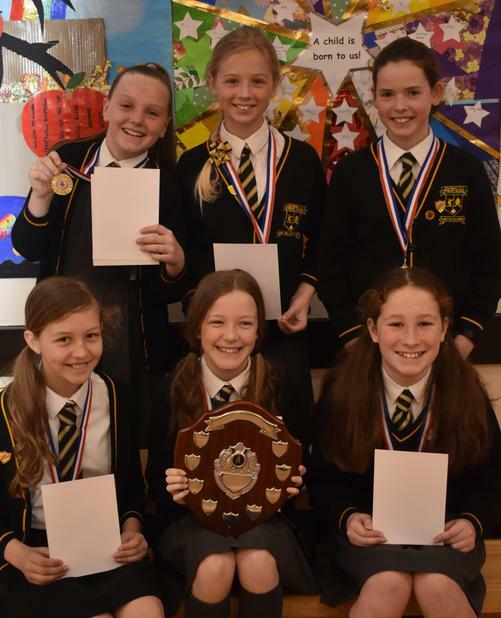 Childwall A will now compete in the Merseyside County Finals in March; good luck! We took two teams to the Y5&6 Table Tennis competition at SFX College this week. The children have been using their lunch times to practice for the event and it was no surprise that both teams got off to a good start. Our two teams played in separate groups before progressing to the semi- finals and meeting in a head to head. The result didn't matter too much as both teams had already qualified for the City Finals in the New Year, but there had to be a winner. Childwall A Team won and went on to win the final against Bishop Martin to take home the medals. Well done everybody and good luck in the City Finals! Our Year 2 Sportshall Athletics team also made their way to Toxteth Firefit Hub to take part in their City Final competition and it was the first time that this event had been opened up to KS1 children. All of the team were really excited to take part and gave their all in each event. The children were absolutely thrilled to bits when it was announced that Childwall had finished in first place! Congratulations to our KS1 Sportshall Athletics CITY CHAMPIONS! Well done everyone. It was the Y5/6 Sportshall Athletics City Finals at Toxteth Firefit Hub this week and in attendance were the best eight teams from around the City. All the schools were told that the top 4 teams would qualify for the Merseyside Games Finals in March and as a team we made this our target. The children gave their best efforts in both the track and field events and waited anxiously for the final results. Although not winning the competition, we were delighted to find out that we had qualified for the Merseyside Games! Very well deserved everyone; well done! The girls played against a really good Blackmoor team this week. After falling 2-0 behind in the first 10 minutes, the girls started their comeback just before half time with a welldeserved goal. They then pushed on in the second half and played some great football to get themselves back in the game with a second goal. The comeback was completed with two late goals and the team were thrilled with the result. Well played girls! The boys' team played against a good Rudston Primary team in a Broadgreen league match at Heron Eccles. After going 1-0 down in the first couple of minutes, the boys reacted brilliantly to completely turn the game around before half time. We won the game 7-2 in the end - great performance from the boys; well done! A group of Y2 children took part in the KS1 Sportshall Athletic Heats this week where they each had to compete in 6 events including Standing Long Jump, Speed Bounce and Over and Under Relay. The whole team were really well behaved at the competition and gave their best efforts in each event. The children were delighted to find out that they had finished in 1st place overall and couldn't wait to get back to school to show off their medals. The team have now progressed through to the City Finals; well done everyone! A huge well done to Jamie, Jack, Maisie and Isabella who were selected for the Liverpool Representative Team in the British Cross Country Challenge U11 race on Saturday 24th November at Sefton Park. We were also delighted to see Max from Y5 representing Liverpool Harriers and it was really nice to see the Childwall boys and girls running together. What a fantastic effort from our children, racing against some of the best runners in the whole county! Congratulations, everyone. 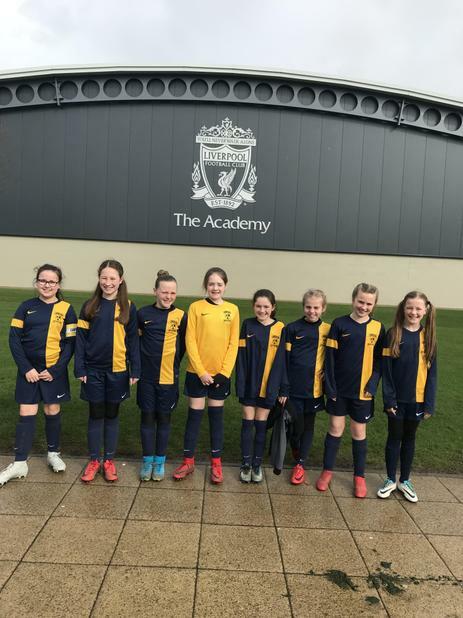 Our girls' team received an invitation to play in the ESFA Danone U11 Girls' 7-a-side Schools' Cup, following our last year's success and we were the only team at the event representing Liverpool Schools. The girls played 3 tough matches and only conceded 2 goals resulting in 1 win, 1 draw and 1 loss. Unfortunately the girls did not progress through to the Finals as they finished 3rd in the group. Well played girls, great effort! We were delighted to welcome Adella Dando from the Liverpool Schools Sports Partnership into our school today to present us with the School Games Mark GOLD Award for the 2017/18 academic year. The School Games Mark is a Government led award scheme launched in 2012, facilitated by the Youth Sport Trust to reward schools for their commitment to the development of competition across their school and into the community, and we are delighted to have been recognised for our success. Maisie and Josh from Y6 received the award on behalf of the school, two children that consistently demonstrate the School Games Values; determination, passion, respect, self belief, teamwork and honesty. Well done to all of the children, staff and parents that have helped to contribute towards this award! Unfortunately, the girls' match at Broadgreen was cancelled. However, we received all three points towards the league table. We look forward to the next game! 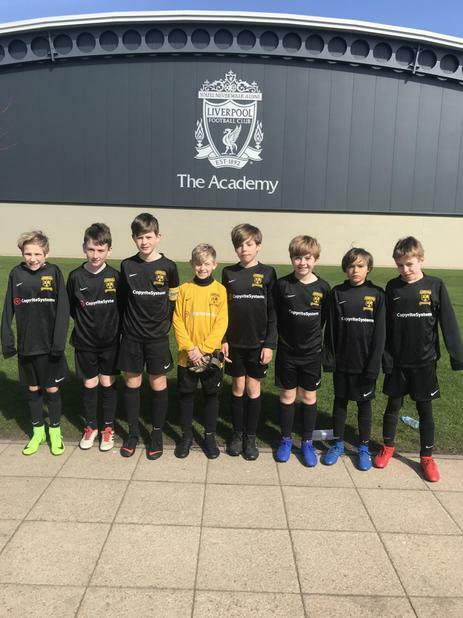 Again, our Y5/6 boys’ football team played in the Premier League Primary Stars Tournament hosted this time by Liverpool Foundation for a chance to progress through to the Regional Finals in March. The team went unbeaten in the competition, conceding only one goal, securing their place at The Liverpool Academy Regional Finals. Great result, Boys; well done! A group of Y3 boys took part in the LSSP Football competition at The Liverpool Academy this week. The children were really excited to play and represent the school and they played some really exciting football scoring 17 goals in their 3 group matches. After winning their group they had qualified for the semi-final and played against a really strong Blackmoor Park team. Unfortunately, we were beaten in this game and the competition for us came to an end. Nevertheless, the children had a fantastic time and enjoyed every minute of it! Well done. The PLPST provides children with the opportunity to represent their local Premier League club in a thrilling National Finals day at a Premier League stadium, should they qualify through both the district level and regional competitions. The boys attended the district level tournament at the new Jeffrey Humble Sports Centre hosted by Everton Football Club. The boys played extremely well, going unbeaten throughout the tournament and securing a place in the Regional Finals at Finch Farm in the New Year. Well done boys, good luck in the Finals. A group of Y5&6 children took part in the LFC Foundation Boccia event at Anfield Community Centre. The children had a really nice time out of school to explore a new sport and thoroughly enjoyed their experience! Well done to the group for their excellent behaviour and attitude whilst out of school. A good, strong defensive performance from the girls’ team saw a goalless draw against a strong St Paul's team. The game could have gone either way and was really exciting to watch. Well done girls; two valuable points towards the table. The girls played their second Broadgreen League match of the season against a very Strong St Teresa's team. Despite being beaten, the girls kept battling hard and working for each other and managed to score a late consolation goal. Good effort everyone, keep your heads up and look forward to the next match! A really tough game for the girls who played away to Barlows Primary School against a strong and physical team. Following an early goal from the home team they didn't threaten our goal again but played a really good defensive game to keep our girls at bay. We played really well together as a team and battled really hard. Unfortunately there was no luck for us in this game as the game finished 1-0 to Barlows. Well played girls! We played in our first Boccia Tournament, hosted by LFC Foundation. We had a great morning with our Can Do friends from Childwall Abbey coaching the team. After a few games of Boccia, it was time for a big game of staff v children! Although the staff won overall, the game won by the children was secured by a great throw by Harry from Childwall. The children thoroughly enjoyed the tournament and they were an absolute credit to the school. It was the second night of the Y5&6 Futsal League and following 8 matches played, the competition came to an end. The team finished in 8th place overall, although playing really well, they were held to lots of draws. It was a great experience for the team and thoroughly enjoyed; well done everyone! The boys played their first LSFA City League match at home against Much Woolton Primary School this week. Goals from Luke and Josh put us in the lead with a couple of minutes left to play, before another late equaliser from the visitors saw the points shared. Final score 2-2, well played boys. The PLPST provides children with the opportunity to represent their local Premier League club in a thrilling National Finals day at a Premier League stadium, should they qualify through both the district level and regional competitions. 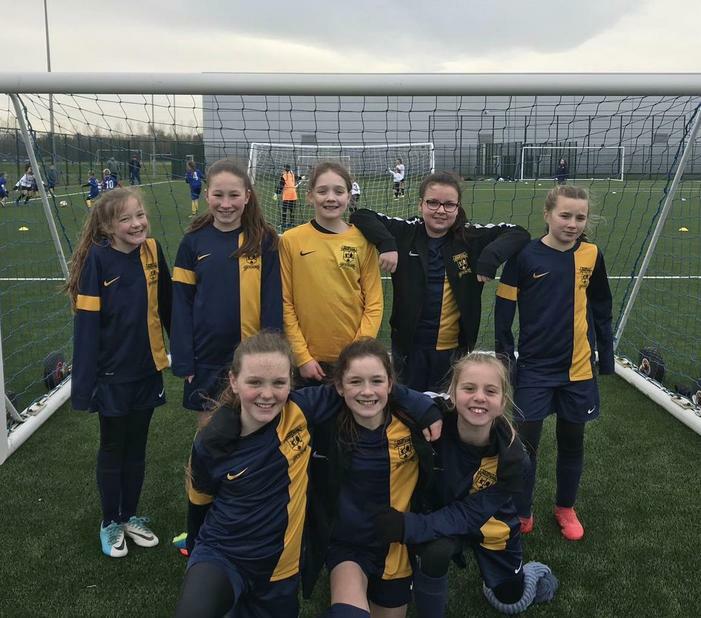 The girls attended the district level tournament at St John Bosco Arts College, hosted by Everton Football Club this week. The girls played extremely well going unbeaten throughout the tournament and securing a place in the Regional Finals at Finch Farm in the New Year. Well done girls, great achievement. The girls played their first Broadgreen League match against Blessed Sacrament in a very intense game. Although the girls found themselves behind on occasions, they fought hard together to score two late goals and take all 3 points in a 4-3 win. Great game! Following last week's Dodgeball competition the team had qualified for the City Finals. The team won all their group games and progressed through to the final to play the winners of the other 3 groups. We were happy to finish in 4th place overall in the City out of the 64 schools that had entered. Great achievement! The girls played their first LSFA City League match of the season this week against a good Dovedale team. The girls played really as a team and worked hard for each other. A great goal from Hannah levelled the scores at 1-1 before two late goals from Dovedale sealed a win for them. Well played girls! The boys played two games in their opening 7 a-side mini league hosted by LFC Foundation. Following their 7-0 win in the first game, the boys were unlucky in the second game, hitting the woodwork numerous times. We lost 2-0 in the end but will take the positives out of the game. Well done boys. It was the first Broadgreen League match for the boys this season against a strong Booker Avenue team. The boys played really well together for the first time and were unlucky not to take all three points. A late equalizer from Booker saw the game finish 3-3. Goals from Jack, Tom Mc and Gabriel. Well done to the Y5/6 Boys’ Futsal team who made a good start in the league, collecting 4 points for the league table. There are two more Futsal events to be played and we hope the boys continue their good form. Well done! The second Cross Country race of the season took place at Newsham Park this week. Another fantastic effort from both the boys' and girls' teams saw almost identical scores as Race 1. The girls team again secured first place position, with the boys finishing in second place. Well done to all runners! It was the first LSSP competition of the year this week in the form of Y5&6 Dodgeball. We took 3 teams to the competition and played separate group matches. It was a very competitive environment which the children thoroughly enjoyed! One of our teams has progressed through to the City Finals which takes place next Friday, congratulations and good luck. Well done to all of the children who took part. The first cross country race of the season took place at Wavertree this week in the Large Schools' Category. There is a maximum of 12 runners allowed for each of the boys’ and girls’ races with the top 6 runners counted towards the overall score. We are delighted to announce that both boys' and girls' teams finished in 1st place overall and have secured the maximum 20 points towards their league score. Congratulations to Jamie in Y6 and Isabella in Y5 on receiving a bronze medal for Race 1! Well done to all of the athletes that took part; keep it up! We are delighted and excited about starting the Daily Mile in our school this year! The Daily Mile is an initiative to improve the physical, social, emotional and mental health and wellbeing of our children, regardless of their age, ability or personal circumstances. It sees children running or jogging at their own pace in the fresh air with their friends and class mates. It is not PE and it is not competitive and it is designed to build relationships, confidence and resilience. At the start of the summer holidays our track was completed to enable us to complete our mile in all weather. 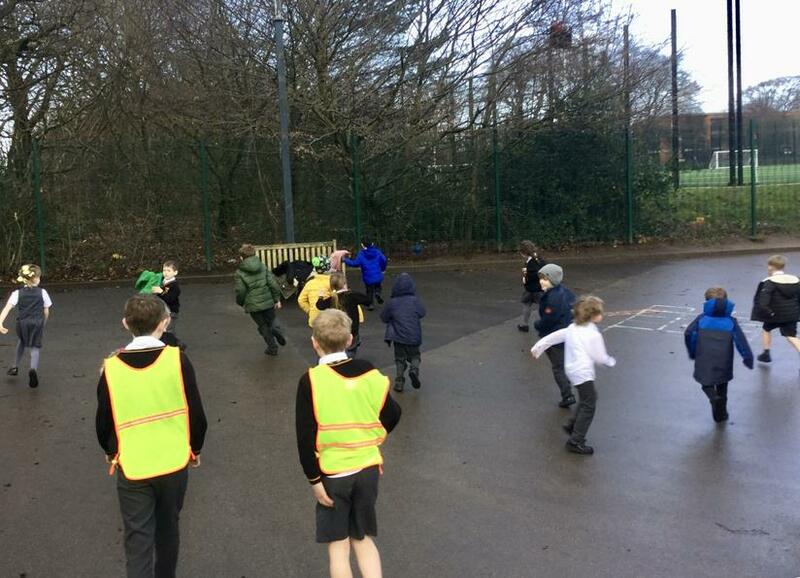 We will be getting out as a class every day to run off excess energy and re-energise ready for learning. 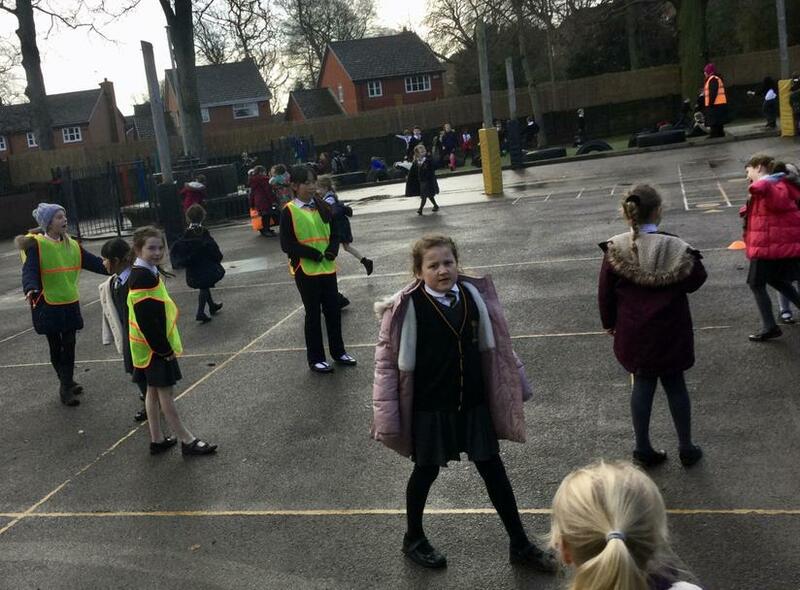 At Childwall Church of England Primary School we believe that sport plays a crucial role in the contribution to the health and well-being of our children. We also believe that sporting excellence and participation go hand in hand with academic standards, therefore the school is keen to fund a wide range of extra-curricular clubs for children throughout the year which are organised and delivered by our teaching staff and sports coaches. In order to support children to participate in 3 hours of sporting activity per week, opportunities will be available for each year group to participate in at least one extra curricular sporting activity between September 2018 and July 2019. Run by the Liverpool FC Foundation, Open Goals provides fun sports activities across Liverpool parks. Free weekly sessions for all the family (children must be 5 years +), with adults and children encouraged to participate together! Activities include: family games, frisbee, tag, football and much more.